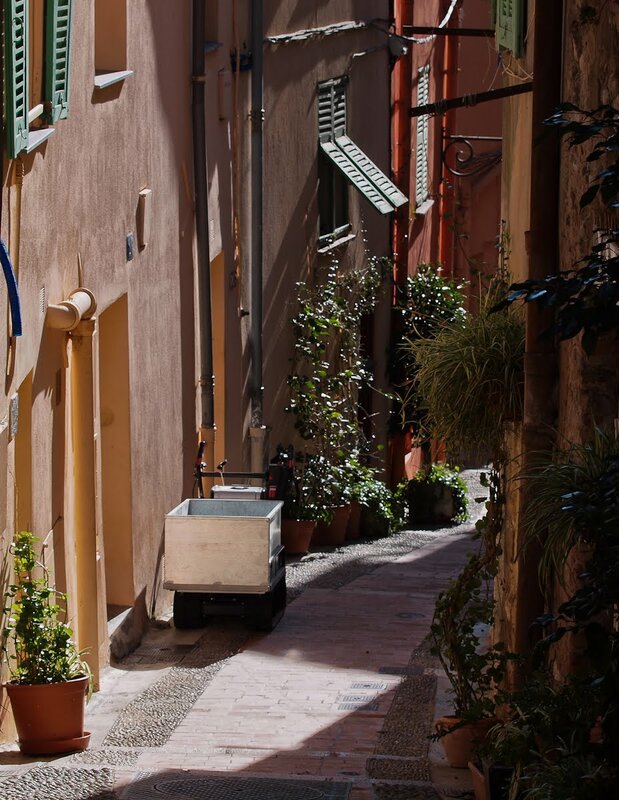 One of the typically narrow streets in Menton's Old Town. Note the tiny vehicle that can negociate the incline including steps that are not too steep. Une des rues étroites typiques de la vieille ville de Menton. Remarquez le mini- chariot à chenille qui peut se déplacer sur une pente et même sur des marches d'escalier peu inclinées. Love the picture. Discovered your blog from A Taste of Garlic. I am collecting pictures of unique cars and trucks we see in France. The one in your picture is a new one for me. I am glad that is the best way to get around otherwise cars would ruin the pristine beauty of this heaven on earth place. Joanny, this street is much too narrow for a car. Just a bike or this tiny vehicle. This is pushed by hand but has a small motor I believe. How perfect for those steep (and narrow) streets... I do believe that there is a motor on it, perhaps like a self-propelled lawn mower. Beautiful shot of this street with or without the little truck! Genie, exactly like a lawn mower with a small motor. And sround the wheels it's like a tank - I just don't know the word for it, in either language! How ingenious! And another wonderful image. That's too cute. We saw a mini truck in Paris that Davis and Eva dubbed the "Smart Car Truck"! It can go anywhere in those narrow alleys. I guess that in Menton you can enjoy life even without your piano! Peter, I've seen furniture lifted by massive cranes into a house but from the other side - ie from the sea side where you see the facade of the Old Town. Then it's brought up 3 or 4 levels by a crane. No small task! All building work is done using these small trucks, such as in the photo, or slightly bigger. Sometimes when I walk the tiny streets of old European towns I, too, wonder how the furniture gets delivered. A piano is a luxury and perhaps warrants a crane. Not a sofa or dining table. So much beauty in those narrow street. I love the shot! All the best for the blog aniversary! I can't wait next amazing photos.